Sintang Regency is located in the “Heart of Borneo”, an area of intact forest the size of England and Scotland combined, and home to endangered species including Bornean orangutans, sun bears (Helarctos malayanus), tarsius (Tarsius bancanus), various hornbills and eagles, and other vulnerable species. The more than one million indigenous people living in the forest rely on it for their livelihoods, and millions more depend on the environmental services it provides, like fresh water. 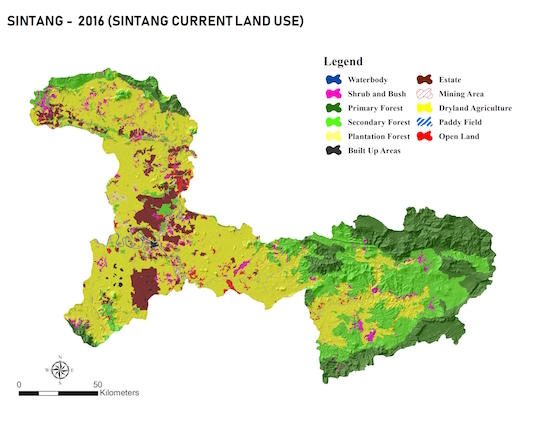 In light of the ecological and economic importance of this forest, the Sintang government committed to its protection and sustainable use under the umbrella of “Green Sintang” (Sintang Lestari), and has been working with CSF to develop long-term landscape planning to that end. Last month, CSF-Indonesia held the second of two workshops to integrate landscape modelling into regional planning in Sintang. In this four-day workshop, participants from the regional government and local NGOs developed two land use scenarios: business-as-usual (BAU), and a sustainable alternative. Each model projected land use for the next 10 years (to 2030), and included sub-models of land degradation, deforestation of primary and/or secondary forest, and land conversion, among others. The sustainable scenario sub-models were built based on results of the scenario planning process conducted in October 2018 with stakeholders. The BAU scenario sub-models were based on trends identified in land use data from the past 10 years. In the sustainable scenario, the model applied strict limits such as zero deforestation, zero air and water pollution, and zero forest conversion in order to achieve the goals of Sintang Lestari in 2030. The BAU scenario matched recent trends in which primary and secondary forest cover were reduced, and plantations expanded. These simulations forced participants to think about the policies necessary to maintain current forest cover, and what compromises may be necessary to balance development and environmental goals. Overall, the participants learned how land use modelling can predict future landscape conditions, and how this can contribute important information to policy decisions. In April, we will conduct a consolidation workshop to synthesize the results of our engagement in Sintang over the past year. This work is made possible by The David and Lucile Packard Foundation.